Ultrasound is a non-invasive and expedient way to look inside the body at organs and soft tissue. There is no exposure to ionizing radiation as there is with X-ray or Computed Tomography (CT) exams. Instead, ultrasound uses high frequency sound waves to create a detailed image of the organ or tissue being examined. Sound waves are sent into the body through a hand-held device called a transducer, which is pressed against and moved over the skin. The ‘echoes’ that bounce back are then displayed as an image in real time on the ultrasound monitor. Most people associate ultrasound with prenatal exams to view developing fetuses, but ultrasound has many applications. It can be used to help make a diagnosis, determine therapy options and guide medical procedures. Advances in ultrasound technology continue to expand its capabilities. •Traditionally, hand held ultrasound has inherent issues that make it not well suited for breast cancer detection. However, studies show that ultrasound mammography like we use in Coral Springs, FL can increase its discovery. The GE Healthcare, PMA-approved InveniaTM ABUS creates reproducible, wide field-of-view volumes in a time efficient manner, thus well-suited for a screening workflow. sooner regarding the presence or absence of breast cancer. What is special about Invenia ABUS technology? 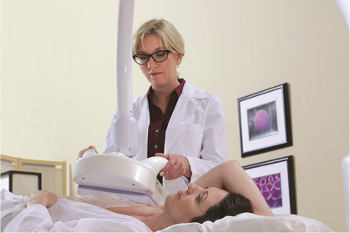 • Technology advancements: Using proprietary technology to automate the ultrasound imaging process, the Invenia ABUS system was created specifically for breast screening. Advanced algorithms automate the imaging process to help provide remarkable image quality and reproducibility from user to user. • Reading station: Developed specifically for the high-volume, breast cancer screening environment. The advanced 3D Invenia ABUS Workstation enables fast, accurate review and archiving of patient exams, optimizing the breast ultrasound screening workflow. • Ultrasound is a proven diagnostic tool in breast imaging. With its non-invasive, non-ionizing radiation, real-time and economical nature, ultrasound is an important screening modality as an adjunct to mammography. In some cases, this innovative system may also help reduce the need for invasive tests or provide an alternative to exams with X-ray or CT that expose patients to radiation. • Invenia ABUS has been proven to increase cancer detection by 35.7 percent in women with dense breasts and no prior breast interventions. • Invenia ABUS exams are short and comfortable. technologies like those offered by Invenia ABUS continue to improve the workflow and sensitivity of ultrasound. • Invenia ABUS reduces the time and operator dependency as compared to conventional hand-held breast ultrasound through its use of a wide field-of-view transducer that automatically scans the breast, acquiring volumetric image datasets. routine ultrasound cannot, which results in the ability of physicians to detect more breast cancers and less false negatives (findings due to images which are not cancer). How Does Invenia ABUS Benefit Physicians? • With improved contrast resolution, the Invenia ABUS has the potential to reduce false positives and improve diagnostic confidence when characterizing lesions. • With the coronal view capabilities provided by Invenia ABUS, clinicians have the ability to interrogate suspicious areas in a 3D plane. The ability to see the entire breast, not just the sample images, gives clinicians greater control over the review process, supporting more confident decisions. How Does the Invenia ABUS Benefit Practices? Quick, automated acquisition helps overcome operator dependence and long exam times associated with hand-held ultrasound or conventional ultrasound. • Where hand-held ultrasound exams are typically scheduled in 45 minute increments, a bilateral, full-field Invenia ABUS exam can be completed and sent for review in approximately 15 minutes. • The faster Invenia ABUS workflow enables sites to free rooms more quickly and free technologists for diagnostic breast ultrasounsds and other exams. The result can be better resource utilization and potential for revenue opportunities.